Small changes can make a big difference and especially so when it comes to reducing your blood pressure. This is exactly the action the American Heart Association and the American College of Cardiology took when they announced new blood pressure guidelines released in November 2017, which lowered the definition for high blood pressure from 140/90 millimeters of mercury (mm Hg) to 130/30 mm Hg. The reason for the lowering of blood pressure guidelines was due to knowledge gained from large trials from research studies. Since that change, many of us may now be part of the almost half of all American adults (46%) to now officially have high blood pressure. If you now are considered hypertensive because of this switch, no need to panic but this change should spur you on to take your blood pressure more seriously. Having hypertension is a huge risk factor for heart disease and stroke, which are two of the leading causes of death in the United States. The idea was that prevention is better than late treatment and by diagnosing high blood pressure earlier, it can save lives and money from strokes, cardiovascular events and kidney failure. Anyone with a blood pressure reading of at least 130/80 or higher is simply at a greater risk for a heart attack, stroke, kidney disease, eye disease, and even cognitive decline. The goal of this new guideline is to encourage individuals to treat their high blood pressure more aggressively by taking action to bring it down, primarily using lifestyle interventions. 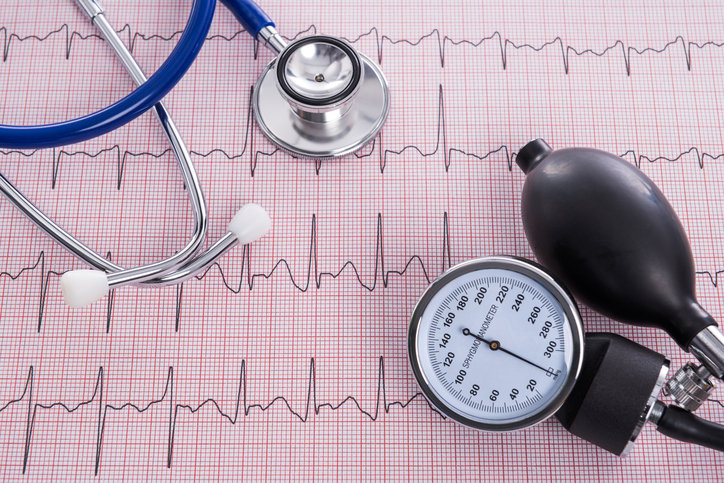 It is well-documented that lifestyle changes can lower blood pressure as much as medications can. The average American loves their sodium and takes in nearly 3500 milligrams (mg) of this mineral every day. The American Heart Association recommends no more than 2,300 mg a day and an ideal limit of no more than 1,500 mg per day for most adults. Just ¾ of a teaspoon of salt already totals 1,500 mg of sodium. One Egg McMuffin breakfast sandwich contains at least half of that amount. Reduce high sodium foods by reading labels frequently. Unless you look at the nutrition facts label and read what the milligrams of sodium is per serving, you will have no idea the amount you are consuming. Some common foods surprisingly high in sodium include breads and rolls, cold cuts and cured meats, pizza, poultry (fried or canned not fresh), soup, and sandwiches. Probably the most effective way of reducing high blood pressure is to lose weight. You don’t have to lose a lot to make a difference. Just a 10 pounds weight loss can help lower your blood pressure. Research has shown that consuming too much alcohol can raise blood pressure. To avoid this, consume responsibly by only having one drink a day if you choose. Even a little exercise can go a long way in making a difference in your health and blood pressure. The goal should be to work up to at least 30 minutes of physical activity at least five days a week. Get physical by doing an activity you enjoy which might include brisk walking, bicycling, swimming, or even gardening. Stress can trigger unhealthy habits putting your cardiovascular system at risk. When feeling the pressures of life, many of us may turn to overeating, staying up too late at night, using alcohol more frequently, or not exercising. Plus, stress hormones constrict your blood vessels leading to temporary spikes in your blood pressure. Reducing stress should be a priority if you’re looking to lower your blood pressure. Learn simple meditation techniques in addition to practicing deep breathing each day to relax yourself learning to let stress go.